It’s pumpkin time and I’m celebrating my favorite time of the year (yep, it’s not summer but faaaallll) with this easy pumpkin pasta sauce made from butternut squash. 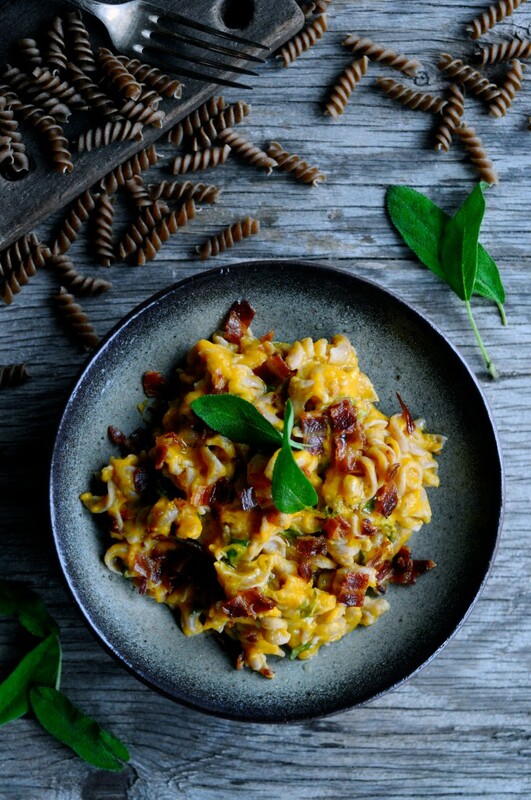 I love to use the different kinds of pumpkins for making sauces like I’ve done in this recipe but also in other recipes like this favorite of mine pumpkin risotto with pearl barley ,where I’ve used a Hokkaido pumpkin to make a creamy risotto. Easy pumpkin pasta sauce with wholegrain pasta! 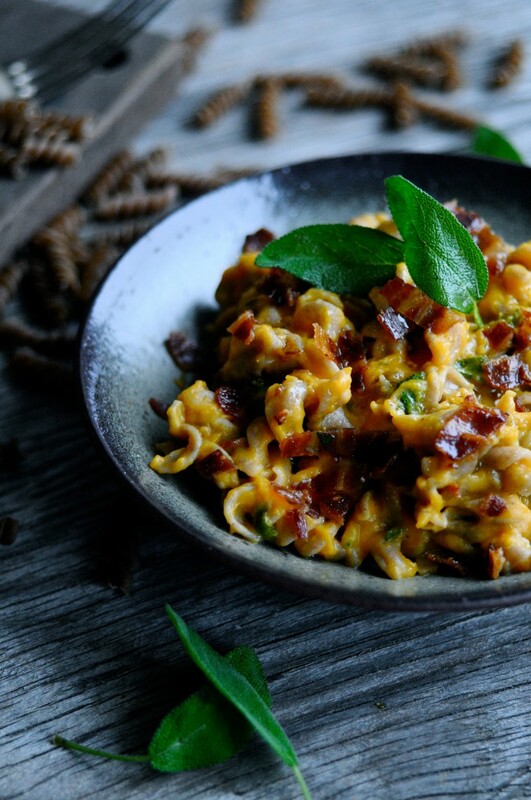 In this recipe, I’m serving the easy pumpkin pasta sauce with some rye fusilli. If you’re not able to get a hold of exactly the rye version, never mind, any other wholegrain pasta works just fine. But don’t leave out the bacon! 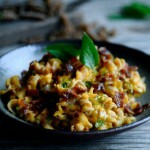 That’s a key ingredient in this meal and bacon and pumpkin is oh so good together but maybe you already know that?! Yep, that’s right. A little baby boy is growing inside my belly and I can’t wait to meet him in February. It’s an exciting new chapter of my life and I just can’t wait to start it. And I’m sure that this is not the last thing you’ll here about my little family extension, so now you’re warned! Cook the peeled butternut cubes in water that cover along with one vegetable stock cube. Boil the butternut until tender. Drain BUT save about 0.4 cups of the vegetable broth for the sauce. Transfer the cooked pumpkin to a food processor or blender along with the vegetable broth, milk, a good pinch of grated nutmeg, chili flakes and grated parmesan. Blend until you have a thick, creamy sauce. Add perhaps some more milk or water, if you want the sauce to be thinner. Season with salt and plenty of freshly ground pepper. Pour the pumpkin sauce back into the pot and keep it warm. Fry the bacon until crisp in a pan and place it on a piece of paper towel to remove excess fat and keep it crisp. Cook the pasta until al dente and mix the pasta together with the pumpkin sauce along with 2 handfuls of finely chopped sage. 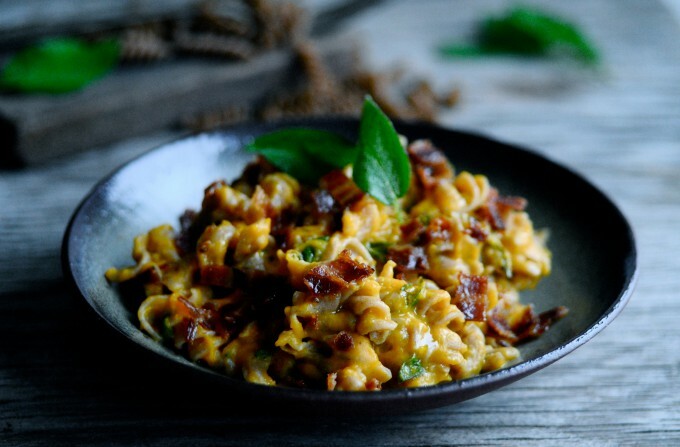 Serve the pasta straight away with chopped crisp bacon and extra fresh sage. Sprinkle with lots of freshly ground pepper and salt flakes.